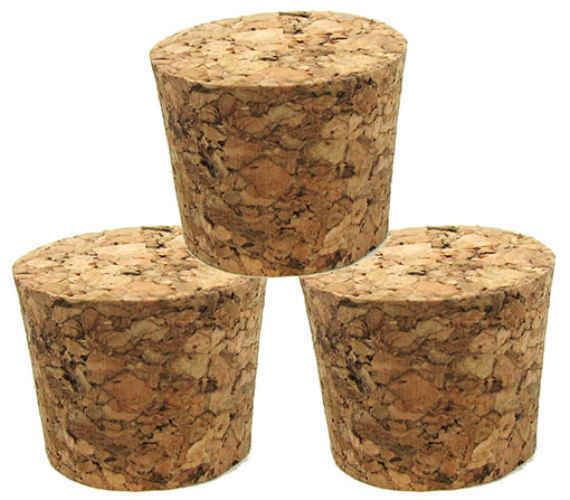 We have obtained a large number of real natural corks ranging across the popular sizes used in science labs to seal vessels (drill your own holes for glass tubing, etc), use as floats and as a great craft item. Or just use them to seal bottles that don't have closures or cry out for a decorative seal. Pat's been hanging around the medical supply house again. We now have a boatload of rubber stoppers, the kind you see on bottles of liquid medicine, crimped down with an aluminum collar. (Pat didn’t buy the aluminum collars.) The medicine is removed via a hypodermic needle through the stopper. 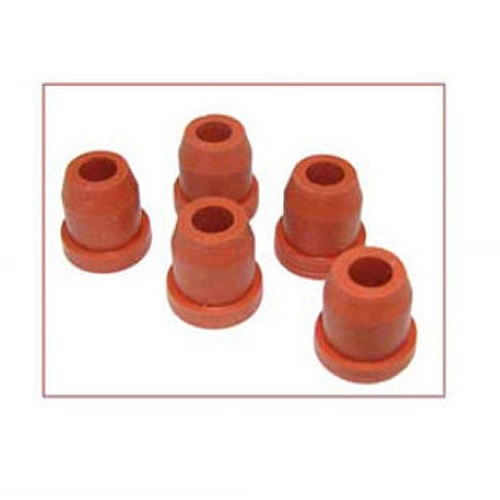 The rubber stoppers come in a friendly orange and fit (13 mm) dia openings. The orange are 9/16" across the top, which has a dimple in the center, and 9/16" top to bottom. Why would you want them? Because they'll fit many of the small wide-mouth and slope-shouldered bottles in our Bottlemania listing. Pat's really good! 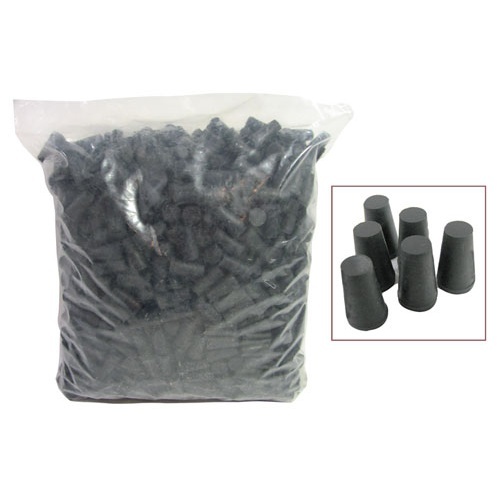 So Pat went a little crackers and bought approximately 897 gazillion #00 rubber stoppers, enough to stop up every small test tube in every high school science lab from here to Osaka. You'll get a bag o' (1,000) of them. We know you'll find a crafty use: tiny bowling games, non-conductive earrings and necklaces, little bumper car bumpers, traffic cones for cockroaches, stubby guitar picks.... 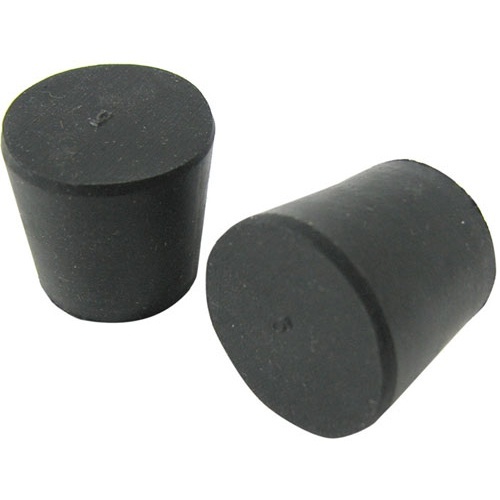 In black rubber conic sections, 1" long x 10mm (0.39") at the bottom x 14mm (0.55") at the top, or vice versa. Please note: This item can only ship UPS ground.Your entire order will ship UPS ground when ordering this item. Jumbo sized cork for all your corking needs. Bottles or crafts its the perfect size. 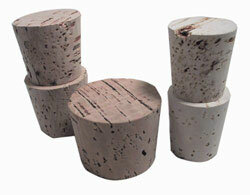 1-1/4" top x 1-1/16" bottom and 15/16" tall. Cork away! 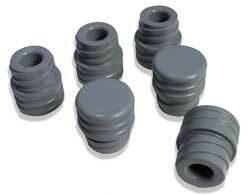 They're gray rubber stoppers, 3/4" dia at the top, threaded at the bottom to fit 17mm ID bottles. They're 7/8" long OA, with a threaded portion 7/16" long. Which doesn't matter a whole lot if you're using them for their most obvious use, which is to glue them to your neck for the world's absolutely best Frankenstein costume! 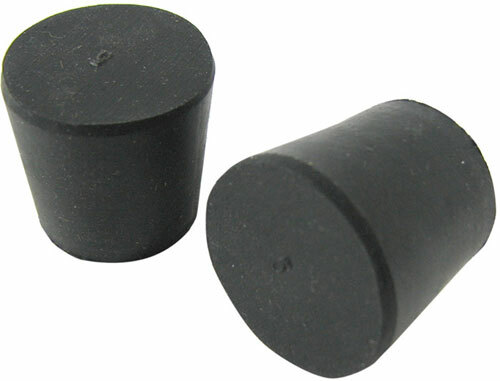 Black rubber stoppers for all your unmet rubber-stopper-top needs. You pick the bored (for laboratory tubes or making shakers) or the unbored, if you need closure. This white-plastic childproof cap plugs an 11/16 " bottle opening. Turned over, it fits over the thin lip of the bottle, but has a small opening/vent. We're not sure what it's venting, because we're not sure what kind of bottle it fits - but we know some of you erstwhile fans will know, and that you'll need a bunch of them. These are left over from those scrumptious hot meals that hospitals serve. Use the trays and lids when you're under the weather, or serving someone who is. On the other hand, we think the trays also make perfect indestructible flower pot saucers, and the lids, which have recessed handles so they can sit on their heads (which is more than you can do), would make nice wide planters themselves. Some of them say they can take heat and some say they can't but we're pretty sure they're talking about hospital ovens because they all do just fine warming up tortillas in the office microwave. 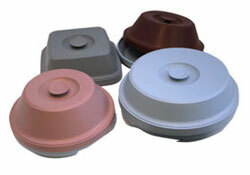 Assorted unmatched colors (our choice). It’s so much more tasteful than putting a sock in it. 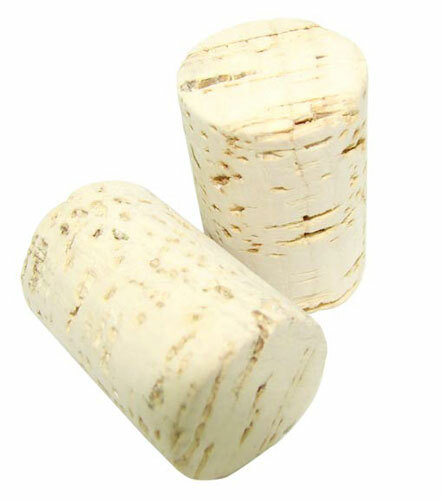 We highly recommend these non-tapered cylindrical natural corks, 1” dia x 1-1/2” long. Good nostalgic fishing bobbers or craft fodder, too.